Communities of microorganisms also live in larger organisms, including humans. 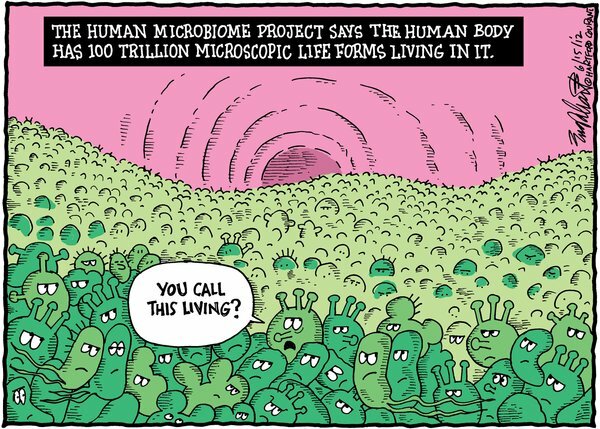 Collectively, the bacteria that live inside us are called the Human Microbiome. Although in the past most human microbiology research has focused on pathogenic or "bad" bacteria, we are finding that the rest of the ("good") species present can be important for health, too. How a particular community of bacteria influences different human functions has been difficult to identify since there are so many species we cannot culture. Researchers are finding that microbiomes vary with diet, taking antibiotics, and even with method of child birth. In addition, we are finding that changing our microbiome in some way can help cure hard-to-cure cases of diseases. Many of these studies, at their core, ask ecological questions that are similar to ours: what determines the function of a bacterial community? How do microbes respond to stress (antibiotics, change in diet)? 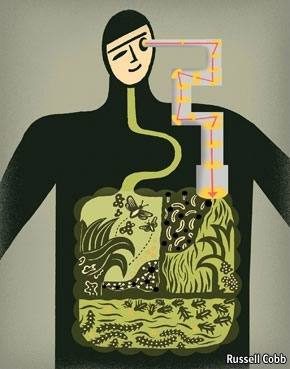 To find out more about the human microbiome, see the popular press articles below.